EgyptAir is planning network and capacity cuts as part of a new turnaround plan aimed at returning the carrier to profitability after an extremely challenging four years. The plan, implemented by EgyptAir’s new executive team, is banking on a combination of network adjustments, more transit traffic and the start of a recovery in inbound tourist numbers leading to a turnaround by early 2015. The carrier is cutting unprofitable routes, including Jakarta, and reducing frequencies across its Asian, European and the Middle Eastern networks. But the total capacity cut will not exceed 10% as EgyptAir’s new business plan envisions an improvement in demand as stability returns to Egypt in the aftermath of the recent elections. EgyptAir has been highly unprofitable since the political crisis in Egypt began in early 2011. The carrier expects to incur another large loss in the current fiscal year ending 30-Jun-2014 as revenues, yields, load factors and passenger traffic have all dropped despite flat capacity. Egypt’s flag carrier has consistently struggled since early 2011 due to prolonged political instability, impacting inbound visitor numbers as well local traffic. EgyptAir’s new CEO, Capt Sameh El Hefny tells CAPA that cumulative losses have reached almost USD1.5 billion since the start of the crisis. He expects the carrier will end the fiscal year ending 30-Jun-2014 with a loss of between EGP2 billion (USD280 million) and EGP2.5 billion (USD350 million). Based on figures for the first 10 months of FY2014 (Jul-2013 through Apr-2014), EgyptAir’s passenger traffic was down almost 3% despite flat capacity as load factors dropped by two to three percentage points to 62% to 63%. Revenues however have dropped at a much steeper rate of about 22% due to eroding yields. EgyptAir’s yields have sunk as the carrier has increased its proportion of transit traffic, which has been a major component of its business plan since the start of the crisis. Transit passengers currently account for 30% to 35% of EgyptAir’s total traffic, up from about 17% a year ago and only about 3% before the start of the crisis. But this has been achieved through heavy discounting, resulting in unsustainably low yields. EgyptAir’s current load factor, which is in the low 60s across both its short-haul and long-haul networks, is also unsustainable. The recovery plan aims to fix these serious shortcomings through network adjustments and an overall reduction in capacity. Capt Hefny says the carrier is now reviewing unprofitable routes and plans to implement a “slim network strategy” over the next few months. Frequencies on some European routes will be cut from Sep-2014 and cuts are also expected on some Asian and Middle Eastern routes. In most cases frequencies will be reduced but a few routes will also likely be suspended. EgyptAir has already decided to suspend services to Jakarta, which was only added in late 2013. EgyptAir initially served Jakarta with three weekly frequencies via Bangkok but initially suspended this routing in early 2014 due to slot issues at Jakarta. Non-stop services from Cairo to Jakarta were subsequently launched in Apr-2014 but Capt Hefny says a total of only 12 flights were operated as the route suffered because of the MERS virus in Saudi Arabia, which impacted demand for Indonesians travelling to Saudi Arabia on religious pilgrim trips. As local demand between Egypt and Indonesia is very small, the Jakarta route was heavily dependent on transit passengers, with almost all the transit passengers heading from Indonesia to Saudi Arabia. Jakarta is now suspended and while it is being reexamined it is unlikely the service will be resumed. Kuala Lumpur, which is also served via Bangkok, is also being reviewed carefully as the route has been heavily unprofitable. EgyptAir has pick up rights between Bangkok and Kuala Lumpur and has relied heavily on these rights as local Cairo-Kuala Lumpur demand is relatively limited. But demand on the local sector has dried up, making the route unviable. EgyptAir already reduced Kuala Lumpur in late 2013 from daily to three weekly frequencies. While the political crisis in Thailand has contributed to the drop in traffic on Bangkok-Kuala Lumpur, EgyptAir does not believe the current routing is viable even if local market conditions improve. EgyptAir is now reviewing options for serving Kuala Lumpur via other cities such as Mumbai but could also ultimately cut the route, leaving it with only four Asian destinations – Bangkok, Beijing, Guangzhou and Mumbai. Guangzhou and Beijing, which are served non-stop from Cairo with five and three weekly frequencies respectively, are performing relatively better than the Southeast Asian network. EgyptAir has benefitted from increasing demand in the China-Africa market, particularly as it has added connections within Africa. Mumbai is served four times per week and could potentially be tagged with Kuala Lumpur. EgyptAir currently uses 737-800s on Cairo-Mumbai, giving the carrier more flexibility than its other Asian routes to meet demand. Europe, where EgyptAir serves 20 destinations, has been impacted by the decline in inbound tourism and stiff competition in transit markets. Europe still accounts for about 20% of EgyptAir’s current international seat capacity but the carrier’s dependence on Europe has gradually decreased since 2011 with more cuts planned for Sep-2014. 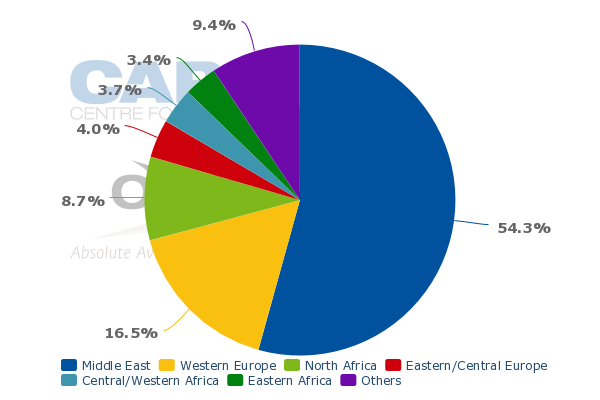 The Middle East is EgyptAir’s biggest region, with 18 destinations and 54% of its international seat capacity. But EgyptAir has added too much capacity into the region, with a heavy reliance on transit traffic and connections with other Star Alliance carriers (as Star does not have any members in the Middle East), having increased its focus on short-haul connections to offset declines in point to point traffic in other markets such as Europe-Egypt. EgyptAir currently has about 130,000 weekly seats to and from the Middle East compared to approximately 100,000 weekly seats in Jun-2011. The increase has proven to be too ambitious, prompting an adjustment as EgyptAir completes its network review. The Middle East will remain an important market and likely continue to account for over half of EgyptAir’s total international capacity. But frequencies on several routes could be reduced and a few small unprofitable markets could be eliminated entirely. But the total capacity reduction will not exceed 10%. “We are approaching a recovery phase so you can’t make too much of a reduction,” Capt Hefny says. An up to 10% reduction seems rather modest given the airline’s dismal figures for FY2014 and the fact its capacity is still roughly at pre-crisis levels. But EgyptAir is optimistic demand will improve and led to more sustainable yields and load factors when coupled with network adjustments. “We expect the country to be stabilised,” Capt Hefny says, pointing out a new parliament will be installed within two to three months and that there are positive indications the tourism sector will start to recover. Egypt’s new president, Abdel Fattah Al Sisi, was already sworn in on 8-Jun-2014. EgyptAir significantly reduced capacity in the immediate aftermath of the Jan-2011 uprising but the cuts were temporarily and capacity returned to pre-crisis levels in Jun-2011. Total capacity has since been roughly flat despite the continued political instability. While total capacity has been flat over the last three years EgyptAir has made several adjustments to rebalance its network aimed at growing transit traffic to offset the declines in inbound and outbound numbers. The biggest adjustment has been in the Middle East where total capacity has increased by 30% over the last three years including by about 6% over the last year, according to CAPA and OAG data. EgyptAir also has pursued significant expansion in Africa but on a much smaller base. Total international capacity in Africa has increased from about 26,000 weekly seats in Jun-2011 to about 42,000 weekly seats in Jun-2014. Growing the African network was a major focus of the previous management team with Abidjan and Harare being added and increases in capacity to most North African destinations. But over the last year Africa capacity has been flat as several destinations that were slated to be launched were removed from the business plan including N'Djamena in Chad, Mogadishu in Somalia and Djibouti. Africa is not expected to see capacity cuts under the recovery plan as the cuts planned will focus on Europe, the Middle East and Asia. But further growth in Africa has been put on the backburner as the carrier focuses on a recovery. Growth in North America, where EgyptAir now only serves New York and Toronto, is also unlikely. Capacity to North America has been flat over the last year while Europe and Asia have been cut and capacity to the Middle East has increased. The overall Asia reduction was driven mainly by the challenges of the Thailand market. The Europe cuts continue a trend which began in 2011 as EgyptAir has decreased it focus on Europe while increasing its focus on the Middle East and Africa, in response to reduced demand for inbound tourists from Europe and in a move to rebalance the network to improve connections to the south and east. Transfer traffic is expected to increase again slightly over the next year, from the current 30% to 35%, as it will take time for the local market to recover. But the capacity reduction and network adjustments should allow EgyptAir to focus on more profitable sixth freedom city pairs and push up load factors. While EgyptAir is now planning to reduce total capacity by up to 10% an adjustment in its fleet is not expected. Capt Hefny points out that the carrier has already dealt with excess fleet capacity by leasing out two of its 777s to Biman Bangladesh and five of its narrowbody aircraft to other Egyptian carriers. The leasing out of aircraft and capacity reduction are sound practical moves as EgyptAir makes another attempt at a recovery. But the turnaround clearly hinges on a dramatic change in the political and economic environment in Egypt. Without such a change the restructuring cannot be deep enough. EgyptAir, which has seen several management changes since the start of the crisis, has some reason to be optimistic. But prior management teams were also optimistic Egypt would finally stabilise, allowing the carrier to return to profitability by the fiscal year ending 30-Jun-2014 (FY2014). Instead EgyptAir will incur another large loss for FY2014. The government-owned carrier is now optimistic it could reach break even in 2HFY2015 following a period of recovery in 1HFY2015. But this will require near flawless execution of its new turnaround plan and clear indications of a much more stable political environment.